PA flags flown for hours at Yafo (Jaffa) Port, just south of Tel Aviv. Police reportedly have not hurried to take down the flags. Israeli flags were replaced by Palestinian Authority (PA) flags on Friday morning at the Yafo (Jaffa) Port, located at the southern end of Tel Aviv. Walla! 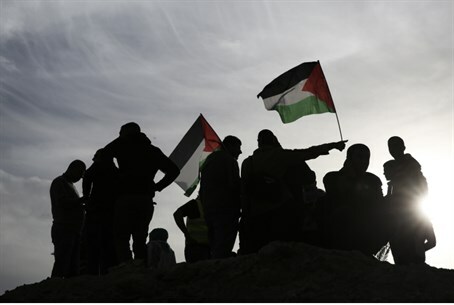 reported the flags had been waving at the site for several hours, and that despite a number of requests to Tel Aviv police, officers or Municipality workers had not rushed to take them down. The flags were put up after Israeli flags at the site were removed; the whereabouts of those flags and the perpetrators of the switch remain unknown. Yafo is home to large numbers of Arab citizens of Israel; in 2011 over 1,000 local Arabs, mostly residents of the Israeli city, protested Israel's existence on "Nakba (catastrophe) Day." The placement of the flags implies with it a claim of PA rule over the region, which is clearly not over the 1949 Armistice lines being used as a basis of peace talks in opposition to the original intent of the ceasefire lines. This latest demonstration of support for the PA comes amid an outcry about the scheduled performance of Mohammed Assaf of Gaza, who won the "Arab Idol" singing contest last June, in the Israeli-Arab city of Nazareth on April 27. The Zionist group Im Tirtzu reports Assaf appeared on a TV show last August, where "he sang the words 'my land of Palestine,' turned to Tzfat and Tiberias, sent blessings to the sea of Akko and Haifa, and sang 'don't forget Nazareth and tell Beit She'an of the return of its people.'" All noted towns are Israeli and not over the Armistice lines. There have been numerous cases of PA flags being flown over Israeli cities, including in the center of Haifa, and at the Dan Panorama Hotel (formerly the Hyatt) in Jerusalem last November for a "secret" PA event being held there. A PA flag was even flown at the Knesset to welcome several PA representatives last August, in a move that raised many eyebrows. In PA controlled areas the game of flags has been taken one step further: Arab residents of Beit Umar, located half an hour south of Jerusalem in Judea, placed a Nazi flag over a major thoroughfare where Jews pass in their vehicles last October, the second such incident in five months.